Great find. The Gospel is so clear in the story and little wonder, since David, as the Lord’s Anointed King, prefigured his glorious Descendant, One Greater than David who slew one greater than Goliath. 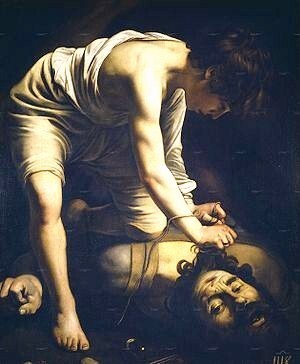 How about this also, David battled Goliath naked (since the biblical record says he took off the king’s armor and proceeded to the battle), and of course our Lord Himself was naked as He slew Hades with the lightning of His Divinity. And yet even more– David picked up five smooth stones. How many times was Christ pierced? One in each hand, one in each foot, and once in His side– 5 times. Once again, another great comment to accompany the post!! Thanks brother! The symbolism is off the chain with early writers. I mean they understood soooo much more than we do today in some degree. Athanay you are right. This is often because they reached such heights of virtue and spiritual gifts that they were taught directly by angels and by the saints who came from heaven to explain things to them. We poor blind and lame spiritual beggars who have no virtues must rely upon such holy men. God is so merciful and gracious to us. “At the present time,” the Elder replied, “owing to our almost universal coldness to our holy faith in our Lord Jesus Christ, and our inattention to the working of His Divine Providence in us, and to the communion of man with God, we have gone so far that, one may say, we have almost abandoned the true Christian life. The testimonies of Holy Scripture now seem strange to us, when, for instance, by the lips of Moses the Holy Spirit says: And Adam saw the Lord walking in paradise (cp. Gen. 3:10), or when we read the words of the Apostle Paul: ‘We went to Achaia, and the Spirit of God went not with us; we returned to Macedonia, and the Spirit of God came with us’. More than once in other passages of Holy Scripture the appearance of God to men is mentioned. “That is why some people say: ‘These passages are incomprehensible. Is it really possible for people to see God so openly?’ But there is nothing incomprehensible here. This failure to understand has come about because we have departed from the simplicity of the original Christian knowledge. Under the pretext of education, we have reached such a darkness of ignorance that what the ancients understood so clearly seems to us almost inconceivable.